Prime Minister Joseph Muscat this morning called for a United Nations mission to restore order and security in Libya, so as not to allow it to become “a failed state”. “We cannot have the cake and eat it, by staying put and expecting the situation to improve,” he said when interviewed on One Radio. In his remarks, the Prime Minister reiterated that Malta was not facing any imminent threat from extremist groups in Libya. He added that Maltese security services together with intelligence agencies from other countries were constantly monitoring the situation. He urged people not to spread dubious or false news from unreliable internet sources. “We are working closely with other countries, and there are no imminent threats to Malta,” he said. Dr Muscat said that the real threat was to the entire Mediterranean region, as this would also aggravate the problem of irregular migration. “If nothing is done the situation in summer will only get worse,” he said. If Libya is a failed state, there will be a free-for-all situation for criminal gangs running these illegal crossings, he added. He noted that even though last year arrivals by sea dropped significantly, the situation could change overnight if the situation in Libya would be allowed to degenerate. “Our duty is not to allow Libya to become a failed state, before acting. This is the time for certain decisions. The only solution is a UN backed intervention, to restore security, and I have been harping on this for a year,” he said. While expressing his objection to any form of unilateral action, he reiterated his backing for the call for UN intervention made by Italy. He remarked that as a neutral state we will be doing our part to promote peace, and can contribute in UN-backed missions. He said that this would be in the form of logistic support. The situation is under control, and urged Maltese to come back from Libya. “people obstinate, urge them to come back. They are against the recommendations of the Maltese government”. However, we are not aware of any possible threat against Malta. We are keeping the Opposition informed on all developments. “We have no military forces to send but can contribute logistically,” he said. Speaking on the economy, the Prime Minister welcomed the EU’s revised economic statistics issued last week for the third quarter of last year, remarking that Brussels admitted it had been “wrong” in its forecast. Dr Muscat pointed out that economic growth projection was revised upwards by 0.2 per cent to 4 per cent, making Malta’s economy the fastest growing between July and September of 2014. The Prime Minister attributed this positive trend to decisions taken in the first few weeks of this administration. He added that employment in Gozo was also on the up. He also reiterated government’s policy in favour of stability in prices, rather than to allow prices to fluctuate according to the market. “This was a failed policy introduced by former minister Austin Gatt,” he said. Dr Muscat noted that this government has already reduced pump prices on seven occasions and they would go down againat the start of next month. Dr Muscat fended off criticism against hedging agreements made by Enemed, saying that these were as form of “insurance” to keep prices within certain parameters. Commenting on recent developments on the oil procurement scandal, he said he would take all necessary decisions, but did not give further details. 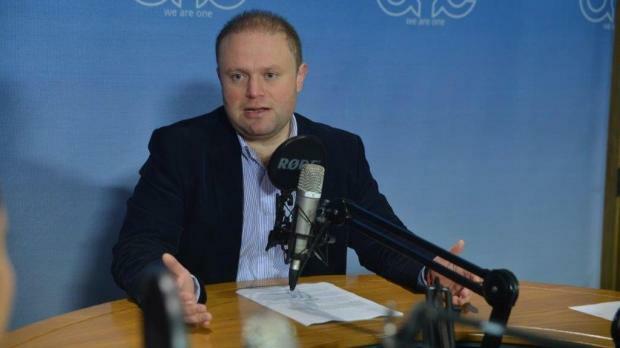 Dr Muscat branded as “shameful” the Opposition’s remarks which questioned the timing of the leakages which exposed this corruption case, weeks before the last general elections. The Prime Minister also reiterated that Malta was against forgiving Greece’s debts but would support measures to make the repayment programme more flexible.